Learn the New Science of Cities at University College London with the MSc in Smart Cities at The Bartlett’s Centre for Advanced Spatial Analysis from September 2014. 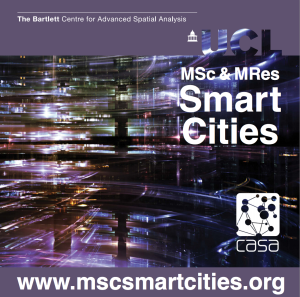 As Course Director, i am pleased to announce the new MSc and MRes in Smart Cities, here at the The Bartlett Centre for Advanced Spatial Analysis. Both the MSc and MRes offer an innovative and exciting opportunity to study at UCL – with key training for a new career in the emerging Smart Cities market. Smart cities are focused on how computers, data, and analytics which consist of models and predictions, are being embedded into cities. Cities currently are being extensively wired, thus generating new kinds of control and new kinds of services, which are producing massive data streams – ‘big data’. To this end, we need powerful analytics to make sense of this new world with a new skill set to understanding and lead this new field. The Bartlett Centre for Advanced Spatial Analysis (CASA) is one of the leading forces in the science of cities, generating new knowledge and insights for use in city planning, policy and design and drawing on the latest geospatial methods and ideas in computer-based visualisation and modelling. CASA’s focus is to be at the forefront of what is one of the grand challenges of 21st Century science: to build a science of cities from a multidisciplinary base, drawing on cutting edge methods, and ideas in modeling, complexity, visualisation and computation. Our current mix of architects, geographers, mathematicians, physicists, urban planners and computer scientists make CASA a unique department within UCL. Our vision is to be central to this new science, the science of smart cities, and relate it to city planning, policy and architecture in its widest sense. The module provides a comprehensive introduction to a theory and science of cities. Many different perspectives developed by urban researchers, systems theorists, complexity theorists, urban planners, geographers and transport engineers will be considered, such as spatial interactions and transport models, urban economic theories, scaling laws and the central place theory for systems of cities, growth, migration, etc., to name a few. The course will also focus on physical planning and urban policy analysis as has been developed in western countries during the last 100 years. This module will empower you with essential mathematical techniques to be able to describe quantitatively many aspects of a city. You will learn various methodologies, from traditional statistical techniques, to more novel approaches, such as complex networks. These techniques will focus on different scales and hierarchies, from the micro-level, e.g. individual interactions, to the macro-level, e.g. regional properties, taking into account both discrete and continuous variables, and using probabilistic and deterministic approaches. All these tools will be developed within the context of real world applications. GI Systems and Science aims to equip students with an understanding of the principles underlying the conception, representation/measurement and analysis of spatial phenomena. It presents an overview of the core organising concepts and techniques of Geographic Information Systems, and the software and analysis systems that are integral to their effective deployment in advanced spatial analysis.The practical sessions in the course will introduce students to both traditional and emerging technologies in geographical information science through the use of desktop GIS software like Arc GIS and Quantum GIS, and the powerful statistical software environment, R. In developing technical expertise in these software tools, students will be introduced to real-world geographical analysis problems and, by the end of the course, will be able to identify, evaluate and process geographic data from a variety of different sources, analyse these data and present the results of the analysis using different cartographic techniques. This module provides a perspective of smart cities from the viewpoint of technology. It will provide a context for the development of smart cities through a history of computing, networks and communications, of applications of smart technologies, ranging from science parks and technopoles to transport based on ICT. The course will cover a wide range of approaches, from concepts of The Universal Machine, to Wired Cities and sensing techniques, spatio-temporal real time data applications, smart energy, virtual reality and social media in the smart city, to name a few. This module introduces you to the tools needed to manipulate large datasets derived from Smart Cities data, from sensing, through storage and approaches to analysis. 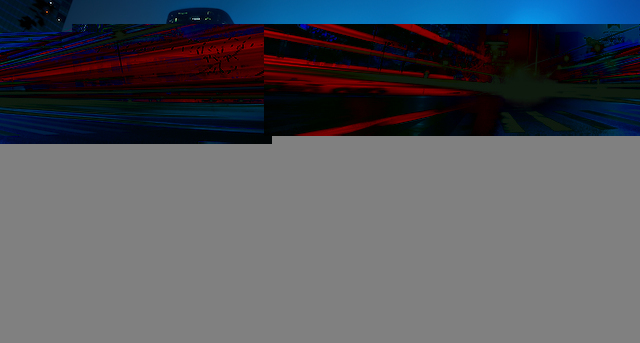 You will be able to capture and build data structures, perform SQL and basic queries in order to extract key metrics. In addition, you will learn how to use external software tools, such as R, Python, etc., in order to visualise and analyse the data. These database statistic tools will be complemented by artificial intelligence and pattern detection techniques, in addition to new technologies for big data. The module provides the key skills required to construct and apply models in order to simulate urban systems. These are key in the development of smart cities technologies. You will learn different approaches, such as land-use transport interaction models, cellular automata, agent-based modelling, etc., and realise how these are fashioned into tools that are applicable in planning support systems, and how they are linked to big data and integrated data systems. These models will be considered at different time scales, such as short-term modelling, e.g. diurnal patterns in cities, and long term models for exploring change through strategic planning. This dissertation marks the culmination of your studies and gives you the opportunity to produce an original piece of research making use of the knowledge gathered in the lectures. You will be guided throughout this challenge by your supervisor and with the support of the Course Director, and together you will decide the subject of research. This enterprise will enable you to create a unique, individual piece of work with an emphasis on data collection; analysis and visualisation linked to policy and social science oriented applications. Ideally, you will already have a Bachelor’s degree in an appropriate subject such as Geography, GIS, Urban Planning, Architecture, Computer Science, Civil Engineering, Economics or a field related to the Built Environment though other subjects will be considered especially if you can demonstrate a keen interest in your personal statement to convince us you should be given a place. You’ll need to have obtained a 2.2 (or international equivalent) to join the MSc. If you do not have a Bachelor’s degree, we can still consider you if you have a professional qualification and at least three years relevant experience, so don’t be put off applying if you fall into this category because the greater the mix of students we have on each course, the more interesting seminars and discussions are going to be. You can apply for this course online or find out more at http://www.mscsmartcities.org – If you have any questions, you can contact our Teaching and Learning Administrator, Lisa Cooper. The course brochure can be download in pdf format (5Mb).